How many times it happened when you tried to select a code block and then moved to its parent block to select the desired code? When the lines of code in a block increases, it becomes difficult to find the first line and last line. 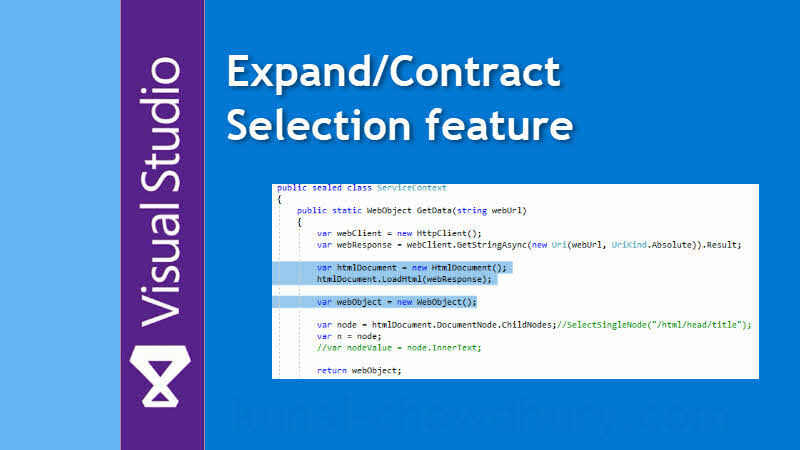 In this part of my Visual Studio Productivity Tips series, we will learn how to use the all new 'Expand/Contract Selection' feature to select a logical code block in Visual Studio 2017. How to increase the list of recent files and projects shown in the Visual Studio File menu? This new feature allows you to grow your selection to the next logical code block and decrease it by the same code block based on your selection. The keyboard shortcut [ Shift + Alt + + (plus) ] allows you to gradually grow your selection to the next parent logical block. Whereas, the keyboard shortcut [ Shift + Alt + - (minus) ] allows you to decrease the selection to the next child code block. Try it out! I hope, this will benefit you selecting a logical code block gradually. If you liked this feature, don't forget to share it with your friends and colleagues. This small tips will help them to improve their productivity while working with the latest version of the Visual Studio 2017 IDE. If you have come this far, it means that you liked what you are reading (Visual Studio Productivity Tips: Expand/Contract Selection feature to ease your life while selecting code block).